Discover an alternative realm of psychiatry without offices or couches! 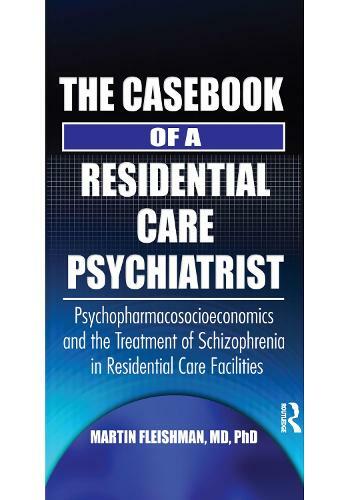 The Casebook of a Residential Care Psychiatrist: Psychopharmacosocioeconomics and the Treatment of Schizophrenia in Residential Care Facilities addresses the problems involved in the onsite treatment of mentally ill patients in residential care facilities. This book is the first to identify the need for psychiatrists to be available to individuals in such facilities as adult homes, community care homes, transitional living facilities, and rest homes. This vital resource also contains specific recommendations as to how these visits should be conducted with regard to frequency, duration, space, and the types of Medicare procedure codes to utilize. In The Casebook of a Residential Care Psychiatrist, Dr. Fleishman uses his 40 years of experience as a psychiatrist to show you the ins and outs of practicing psychiatry in residential facilities. The book also discusses the profound changes psychiatric drugs have produced in the social, economic, and legal arenas. Using anecdotes, personal stories, and actual documents from Dr. Fleishman's files, this book provides you with a wealth of knowledge not found anywhere else. With this book, you'll learn more about: time-saving interview/assessment techniques the importance of psychopharmacology in residential care and how it has changed the practice of psychiatry Dr. Fleishman's method for appropriately creating and using progress notes and other records during treatment ways to work with other members of the residential facility professional community including psychologists, social workers, pharmacists, and administrators to make everyone's job easier the best ways to control paperwork obligations the impact that federal, state, and local government agencies have had on mental health spending, services, and practitioners In The Casebook of a Residential Care Psychiatrist, you will find wisdom, knowledge, and advice along with case studies, tables and examples. While focused on psychiatry and schizophrenia, this book will be of interest to mental health workers, long-term caregivers, and residential facility administrators as well as psychiatrists and psychologists.